I’ve done about 20 screenings of My DDR T-Shirt with accompanying Q&As. I’ve been asked lots of questions, some crop up over and over again, others are more challenging. I’ve sometimes been asked, “What’s the most surprising thing you’ve learned?” I’m not sure if I’ve ever answered it very well, so I thought I’d wander around the issue here. I’ve been surprised by the lasting power of Cold War propaganda and the fixed ideas that people bring to viewing a film. People have pre-conceptions and look for confirmation of these in whatever they see. A ‘good film’ is often one that simply offers the most reassuring confirmation. If there’s one clear message in My DDR T-Shirt, it’s that it wasn’t all bad in the east and it’s not all good in the west. It has surprised me how some people have failed to get that, all because it’s contrary to their pre-conceptions. We’ve had a steady stream of visitors since moving to Berlin. We took one visitor for a walk down Karl Marx Allee. S/he was clearly impressed by the scale of (perhaps) East Berlin’s biggest architectural statement. His/her tongue was in cheek but it makes an interesting point. It is amazing how successful Cold War propoganda was. Or maybe it still is? For many, east of the Iron Curtain means oppression and dictatorship, west of it means freedom and democracy. Their thinking is as simple, two-dimensional and polarised as that. You find this mentality not just in visitors, but you find it in places you’d think would know better. The Lonely Planet, for example, is littered with this thinking. Yep, the bible for free-thinking travellers is full of it. Take Krakow. When describing Nova Huta, it’s all bleak apartments for oppressed workers and the suggestion that this is all that can be expected of communism. In Warsaw, the Palace of Arts & Culture is an unwelcome presence loathed by most Poles as a symbol of Soviet power. The things the Lonely Planet doesn’t like, it attributes to oppressive regimes. But both Krakow and Warsaw also have wonderfully restored old towns. In the devastation of WW2, many of these areas were completely destroyed. The Lonely Planet seems to like these parts of town – the craftsmanship, the attention to detail – but never mentions that it was the same communist regimes that were responsible for rebuilding them. Returning to my Karl Marx Allee visitor, perhaps I should’ve taken him/her to see this area? 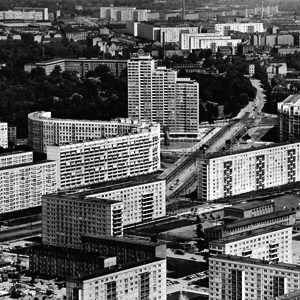 When s/he set eyes on this city of tower blocks, all the the pre-conceptions of the communist East would’ve run riot: the eradication of the individual, the destruction of self-determination, the degradation of humanity – the whole failed experiment. Just out of mischief, I would do my best to lead the visitor a down this line of thought. Cold War propaganda was so powerful, I don’t think it would take much encouragement for its latent power to work. It’s hard-wired into the imaginations of post-war generations. It would just kick in, unchallenged. West: good. East: bad. Of course, I’d wait for the best moment to tell my visitor that the place we’ve been looking at is Märkische Viertel and Cite Foch. And that we weren’t in the former East. We’re in the West – what was once the French Sector. I don’t get a lot of satisfaction from imagining situations that enable me to make a point. The opposite, actually. You just never think of these things at the time, though, do you? Of course, if you want to see high-rise in former East Berlin, you can’t do better you could go to Marzahn-Hellersdorf. But you can find similar post war estates all over the world. The biggest housing estate in Europe is the Aylesbury Estate in London. excellent piece Ian. love the photographs, too. This entry was posted on 13/06/2011 by hawkinsian in Uncategorized.